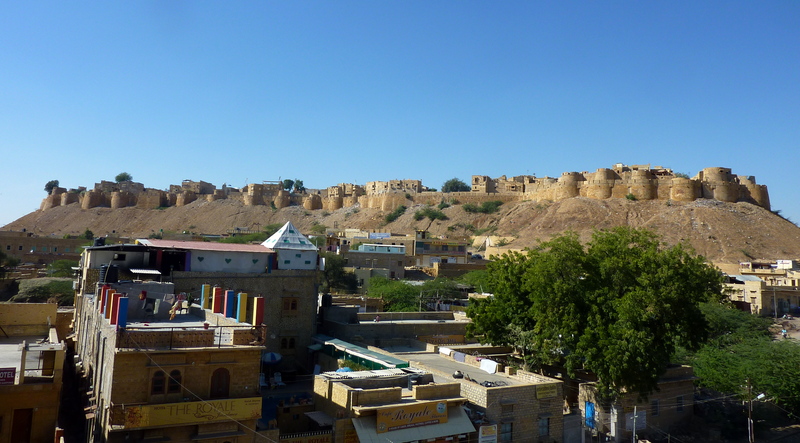 Unlike other forts that I visited on this trip, Jaisalmer is a living entity rather than a relict as some 3000 people still live within its walls and go about their daily business within its maze of narrow winding lanes. Of course much of that business these days involves selling scarves, silver, tapestries, chillums and puffy genie pants to tourists. 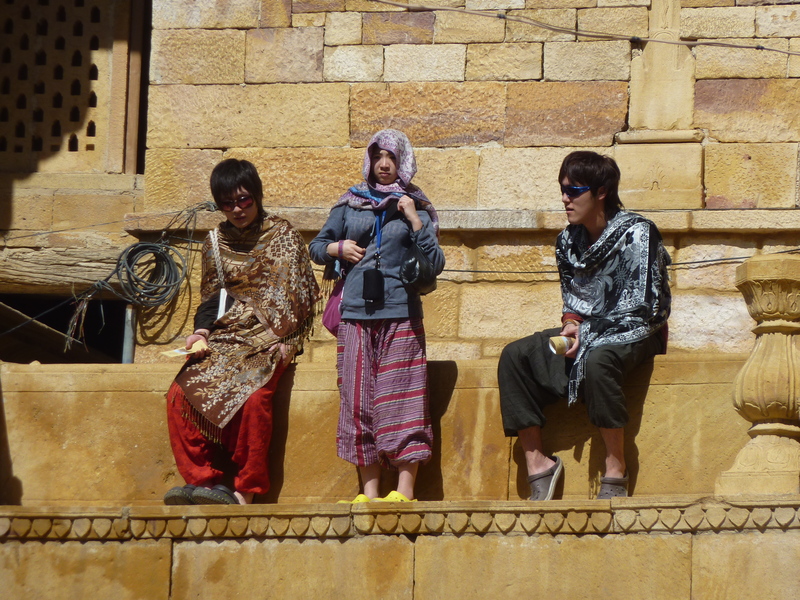 And if there is one thing I’ve noticed about puffy pants in Rajasthan, it’s that no travelers embrace them more whole-heartedly than young Japanese. I have no theories as to why. Please share in the comments section below if you do. It was a pleasant enough place for a few days… aside from the snarling packs of feral dogs that roamed the streets below the fort in the evenings and the symphony of growls, barks, whimpers, howls and cries that they offered up every evening. At times it was frightening even from high upon the ramparts. 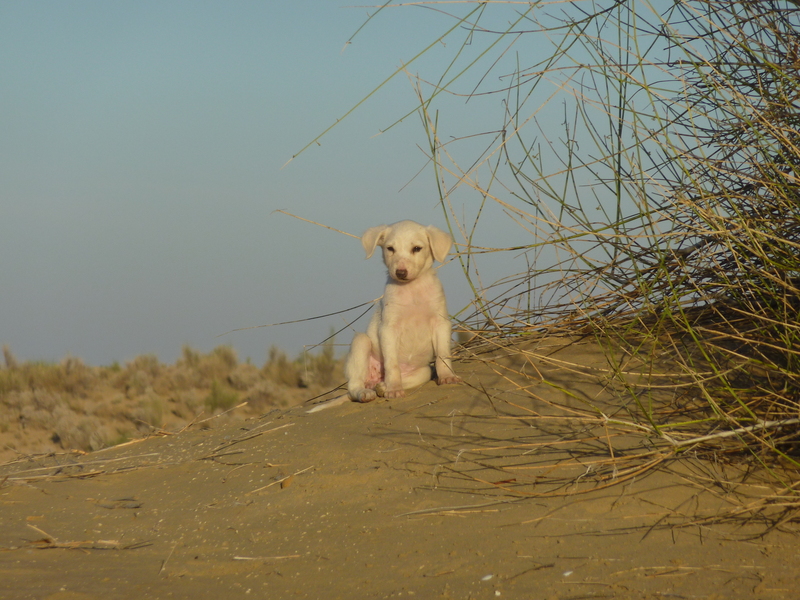 Stray/feral/wild dogs are a serious problem in India and quite a few people are attacked each year. Some die… either from the mauling itself or from rabies and the lack of funds needed to purchase the drugs required for treatment. I love dogs. But I often armed myself with a dog rock or two when crossing paths with a rambunctious pack. Thankfully the dogs I encountered never saw fit to test my arm. 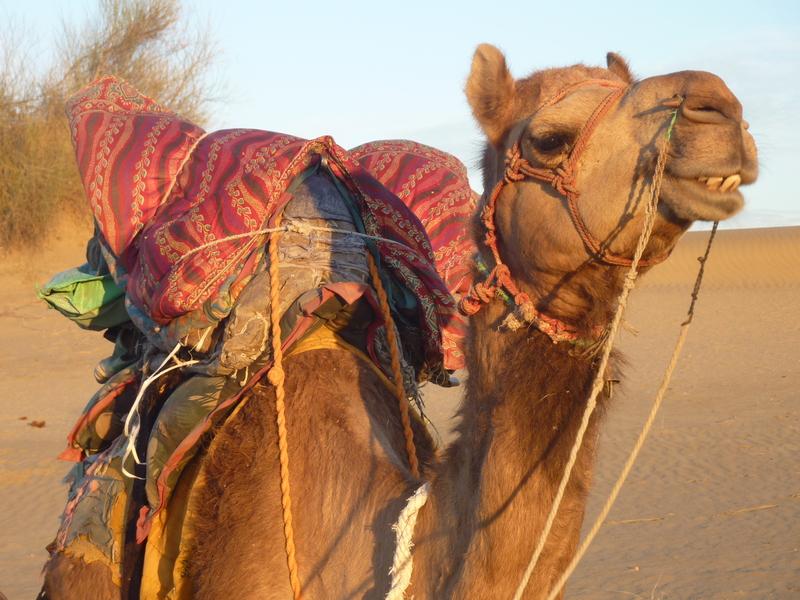 Simon was my trusty steed for an overnight camel safari out into the Great Thar Desert. Both Simon and the safari were brilliant. 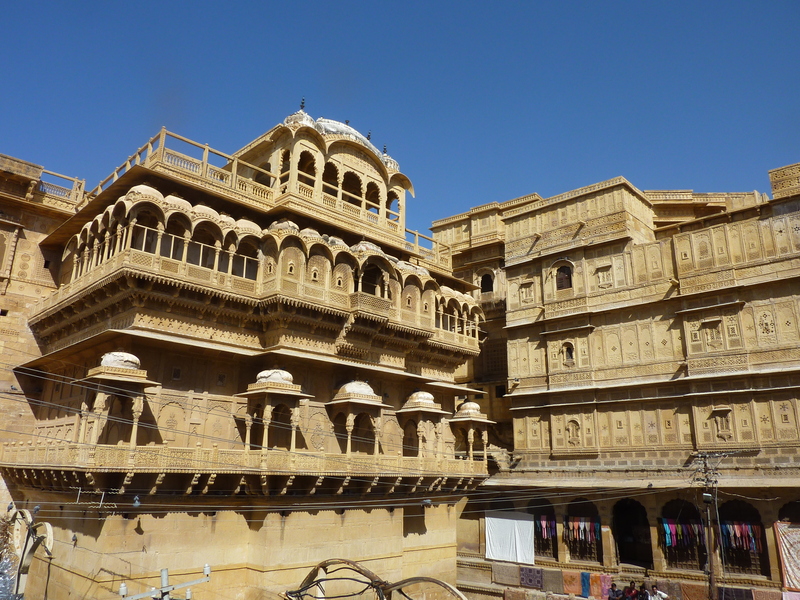 We left Jaisalmer around 8 am by Land Cruiser. 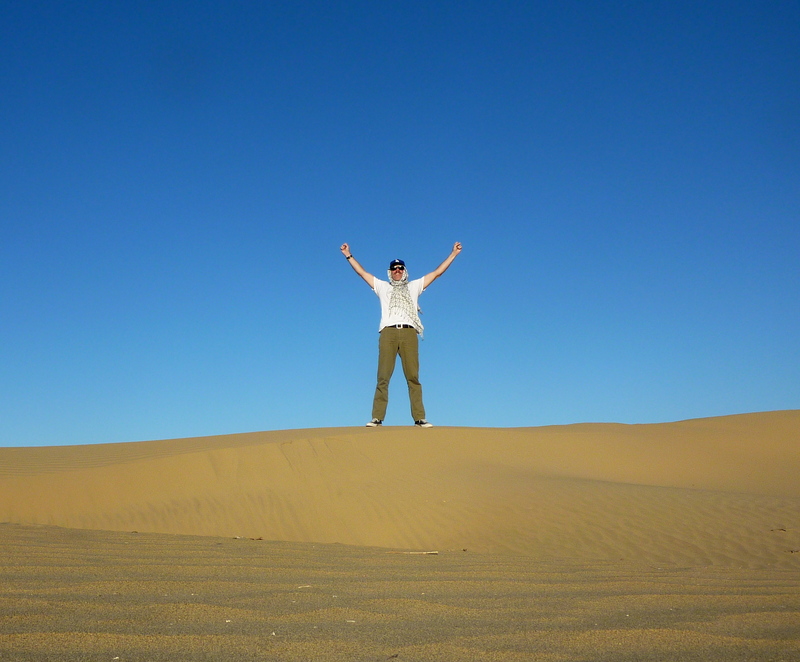 By 10 am my fellow jockeys and I were perched atop our mounts and bumpily making our way out into the desert. Our destination? A cluster of miraculously trash-free sand dunes where we would camp that evening. We paused en route in a small village after about 2 hours of riding in order to stretch some very sore legs and have a look around. 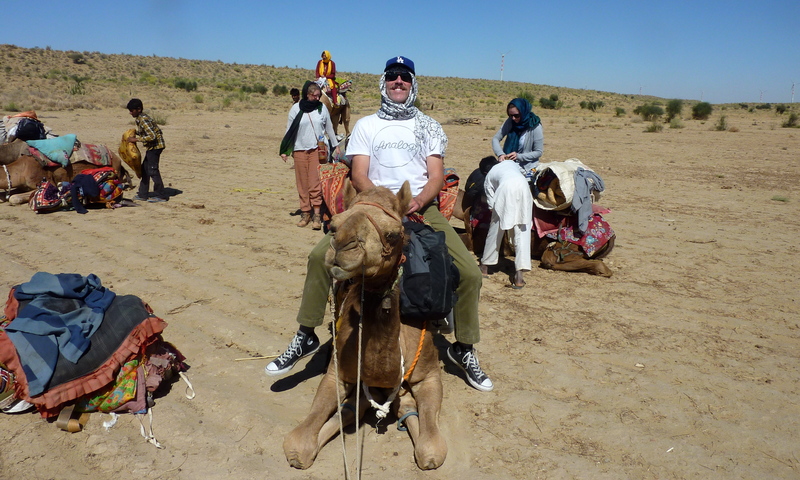 For those of you who haven’t been camel riding, listen to me now and believe me later when I tell you that camel saddle soreness is about 11 times worse than anything I’ve ever experienced on a horse. Fortunately that soreness was mostly in the lower inner thigh muscles rather than the more tender areas to the north of there. It is by no means a smooth ride. But it is by all means a fun ride and a great way to see the desert as you’re riding high and thus the views are great. After fending off requests for chocolates, pens and rupees from the youngest villagers, we hit the trail for another hour or so before stopping for a long lunch and a short siesta under the shade of this tree during which we were visited by a lone wandering goat with a taste for orange and banana peels, and virtually anything else that was thrown her way. Apparently my fellow jockeys and I impressed the drivers with our camelsmanship in the morning session as we were granted a little more freedom with the camels in the late afternoon. They were untied from each other (they had been roped together caravan style for much of the morning) which allowed Simon and I to move to the top of the table and erase any doubt about the class and quality of both camel and jockey. We were blazing the trail at a solid clip when something off to the side caught Simon’s attention. 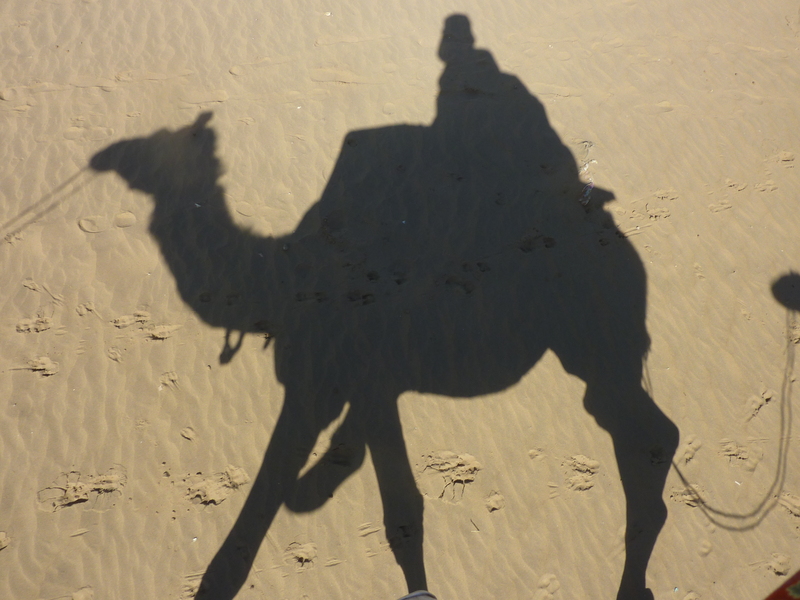 I should point out here that all of the camels in our caravan were dudes and, as we were later told, a caravan functions far more smoothly when it is unisex. Another driver was moving a pack of female camels along an adjoining trail and Simon, being the ladies man that he apparently believes himself to be, decided to pay them a visit, my forceful tugs on the reins in the opposite direction notwithstanding. He made a beeline over to the object of his fancy. Unfortunately it seems that Simon is lacking a bit in the game department as he got right up next to her and then just stood there without even grunting a “hello” or “how’s it going?”. After a minute or so of awkward silence she decided to move on. But Simon was not to be deterred and moved right along with her, again notwithstanding my efforts to get him back to our sausage party of a caravan. At that point the herder of the female camels and one of our drivers arrived on the scene and put an end to the courtship. Poor Simon. He’s going to need to work on those conversation skills if he’s going to have any luck with the camelettes. We rolled up at the dunes an hour or so before sunset and, while the drivers set up camp, the rest of us wandered around the dunes and found comfortable vantage points from which to watch the sun slip slowly below the sandy horizon. It was a great sunset. It would also prove to be a great night. The drivers built a big toasty fire around which our group of 10 or so riders gathered with the drivers for dinner, chai, a few songs, a few stories and a load of laughs many of which came courtesy of Bob aka Baba. Picture if you will a jolly alcoholic chain smoking 67 year old Englishman from Southampton with a mustache and a ponytail wearing a traditional Indian outfit and possessing the kind of infectious phlegmy smoker’s laugh that never fails to set everyone in earshot of it to laughing as well. Bob lives half the year in Southampton where he told us there are 200 pubs and he’s banned from 198 of them. He spends the remainder of the year in Goa which is his base of operations for a smuggling business that supposedly nets him a nice chunk of change. What does he smuggle? Cigarettes and Viagra. He sells the smokes in the pubs in Southampton at roughly 10 times what he pays for them in Goa which still makes them cheaper than an Englishman would pay for legally imported cigs due to high import taxes. He also sells the Viagra at a handsome profit. Best of all, if you believe Bob, there’s no risk of jail should he get caught bringing them in as confiscation tends to be the only penalty. An interesting chap indeed. The drivers loved him and took to calling him Baba which means father but is also a term of endearment. Every time he started laughing, they would go into hysterics and cover their faces with their scarves. At one point late in the evening, Baba let a rather loud one slip out of his Indian trousers and then, in his heavy Southampton accent, added “Must’ve had a few too many chapattis, eh lads?” to which he tacked on his trademark infectious laugh. The drivers began to convulse with laughter which made Baba laugh even harder thereby sending the drivers further over the edge. They were locked in a feedback loop of laughter which the rest of us were dragged into as well. Just as that storm of laughter began to subside, a 14 year old camel driver in training, decided to take a cue from Baba and make his own gaseous contribution to the discussion which of course set everyone back into a fit of laughter once again. I had tears in my eyes before it was all over. It was fireside time of the highest quality. We bedded down that evening on the dunes under the stars using the blankets that had been our saddles and going tentless. The stars were fantastic. Not quite the clarity of the night sky in the Himalaya but captivating nonetheless. I slept reasonably well until around 4 in the morning when I awoke to find that I had company in my bed. I’d curled up into a ball at some point in the night and when I attempted to stretch my legs, I found that this little pup had taken control of the lower half of my blanket bed. I drifted back to sleep after adjusting the positioning of my new bedfellows and didn’t awake again until just prior to sunrise as one of the drivers handed me a hot cup of chai with which to greet the sun. We all gathered again around the campfire for tea and eggs with the sunrise. 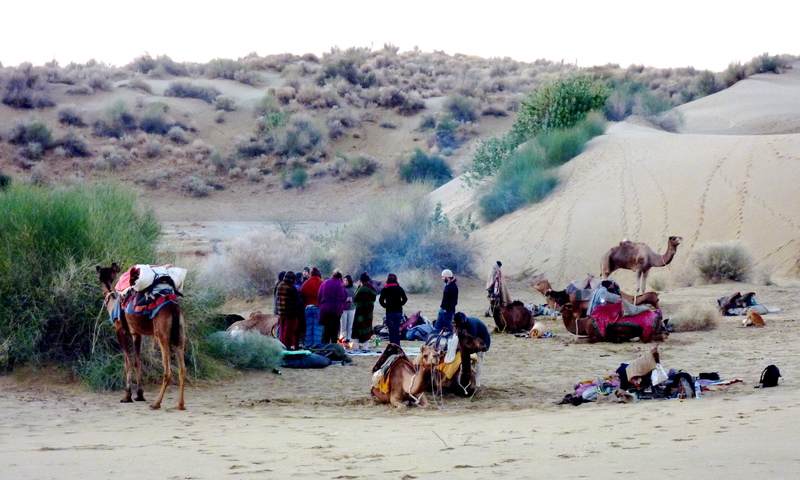 And then it was back to Jaisalmer but not before we got to gallop with the camels which dialed up both the fun factor and the pain factor. All in all it was a tremendous trip. If you’re considering taking one, I’d highly recommend you check out Ganesh Travels as they really do things well, particularly by Indian standards. 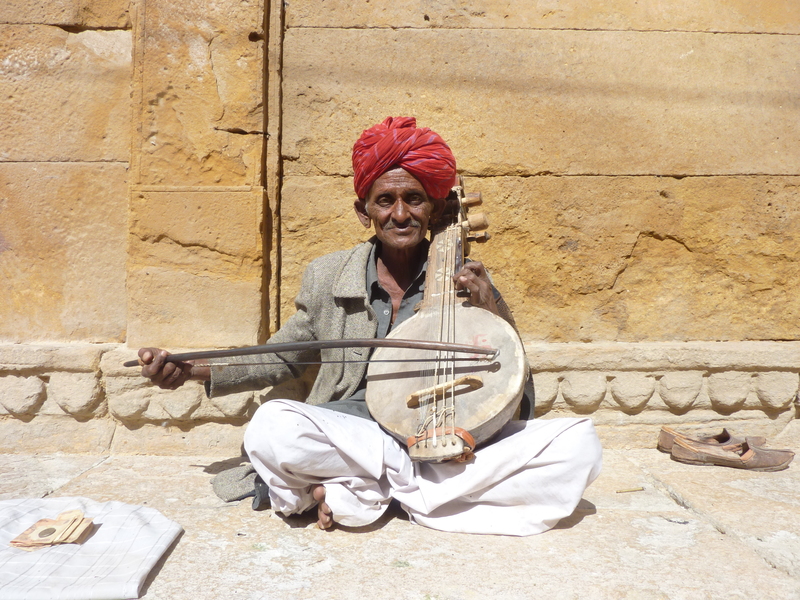 I spent the remainder of my time in Jaisalmer doing what most visitors do. I visited the Fort Palace. I connected with like-minded individuals inside the palace. And I enjoyed some music just outside of it. 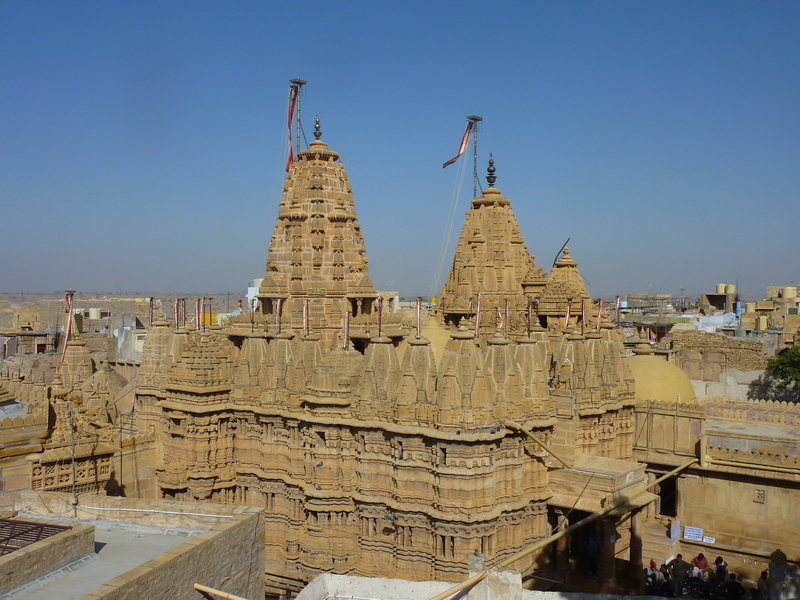 I also visited the Jain Temple. 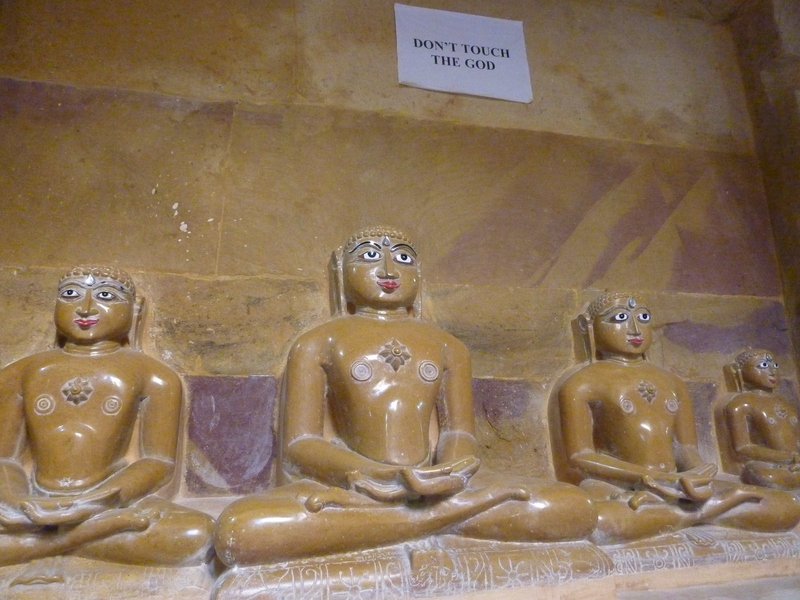 And while I was there I did not touch the god. And on my final evening in town, I met up with a Portuguese couple from my camel trip to try a bhang lassi. If you don’t know what bhang is Google it. We met up at the government sanctioned Bhang Shop figuring that if it was good enough for Anthony Bourdain, it would be good enough for us. And indeed it was. 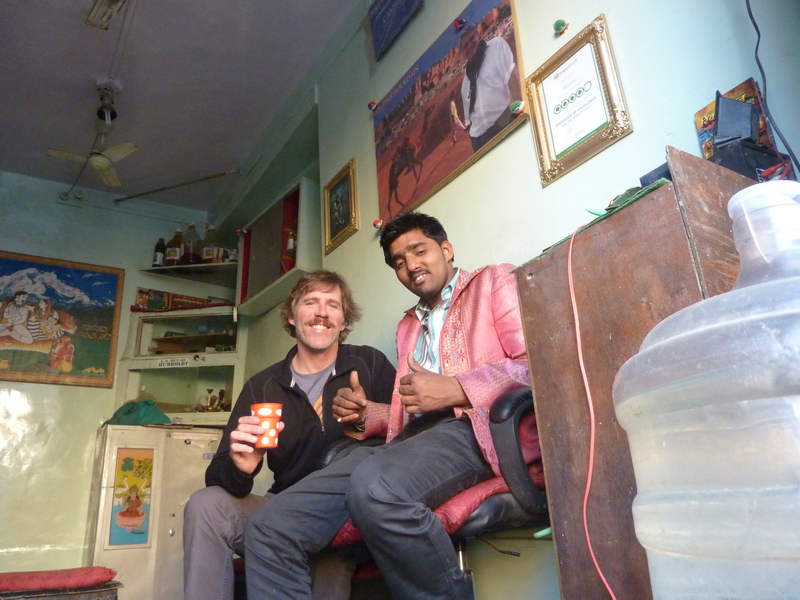 Doctor Bhang took very good care of us which I suppose is to be expected. For as you can probably tell from the picture below, he makes a habit of sampling his goods to ensure they are of the utmost quality. We had dinner on the rooftop of one of the old Havelis within the fort from where we watched another spectacular sunset with its seemingly endless array of purples and reds and oranges. 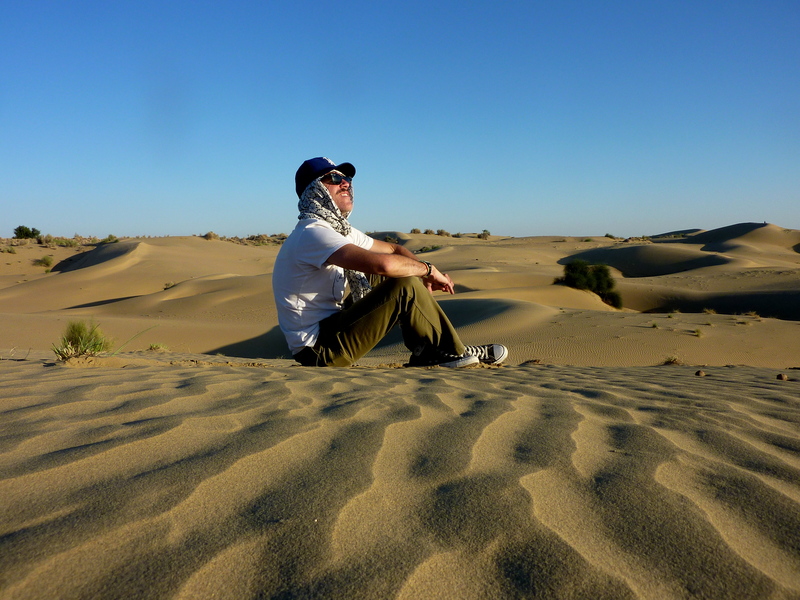 And with that the curtain dropped on my time in Rajasthan. 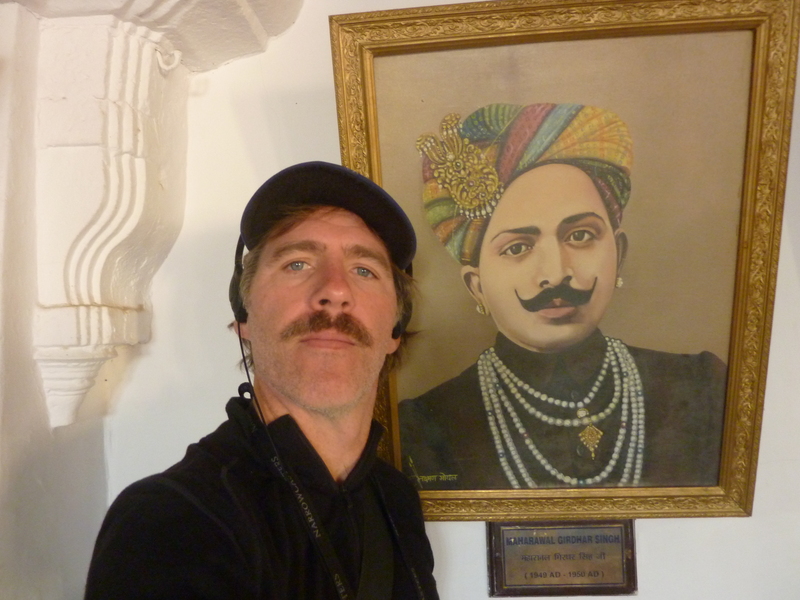 I shipped out the following afternoon on the overnight train to Delhi. I would have but a day in Delhi before departing for Kerala where I would be spending my final week on tour.